Have you ever found yourself at the end of your rope, so frustrated with your kids, that after telling them to do something for the fourth or fifth time, you just lose it and start screaming? Yup. Been there, done that. And then afterwards, you have such a feeling of guilt, because that’s definitely not the type of parent that you aspire to be. 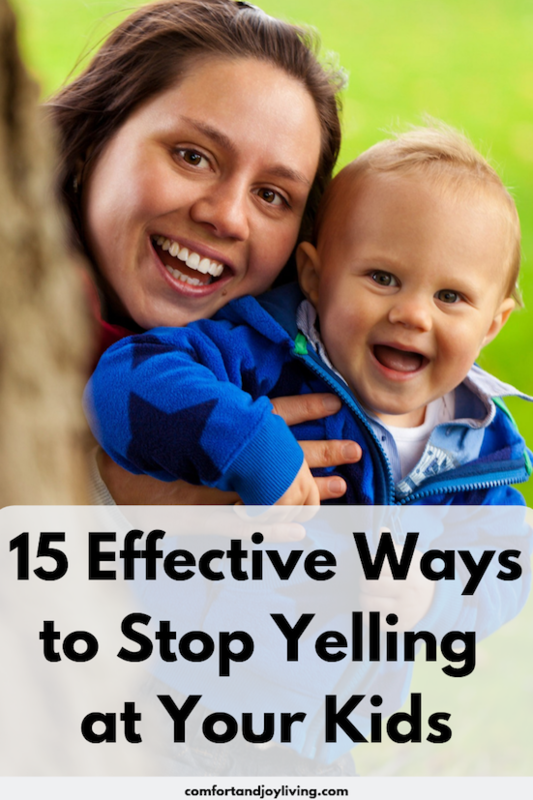 But it can be so darn hard to stop yelling at your kids. So…very…hard. Even though we know deep down that yelling really isn’t an effective option. It’s just loud, angry and awful. It also rarely results in getting your kids to do what you want. And, it often escalates the entire situation and leads to tears, stubbornness and tantrums. So how do we stop yelling at our kids? Here are some tips to help you maintain your composure and relieve the tension of a situation and be more authoritative and less reactive. You’re not raising your children alone. If you want to create a less angry environment and stop yelling at your kids, you’re going to need your partner’s support. Ask them to commit to yelling less too. Develop different strategies together. Be accountable to each other. Help keep each other in check. If you want to reduce your overall household yelling, start becoming aware of how often you raise your voice for everyday things. For example, “Diner’s ready!” “Time to go to school!” “Take out the trash!” By yelling commands for everyday things, you’re raising the volume level in your home and it ends up normalizing yelling. Walk up to your kids and talk to them in a normal speaking voice instead. When you reduce everyday yelling, it leads to less angry shouting as well. Instead of yelling at your child to get them to do something, try to reconnect with them instead. Get down at their level, place your hand on their shoulder, hug them, look them in the eye, whatever it takes to form a connection with them…then ask them what you want them to do. You’ll be surprised at how receptive they are when they feel close to you. This is a tried and true anger management technique. Taking a few long, deep breaths will help calm you down. And, anything that gets you to stop and think before you start to lash out in anger is a good thing. It sounds crazy, right? I used to do this all the time in my classroom. When the kids could become too loud, I didn’t want to yell over them, so I would whisper. I do this now as a mom. It causes them to stop whatever they doing to REALLY LISTEN to what you have to say. It also makes everyone a little calmer. 6. Let Their Consequences Speak for Themselves. If a toy is lost or broken because it was left out, don’t replace it. If they don’t replace it. If they don’t get to go outside to play because they didn’t do their chores, don’t “give in.” Remember, the rules are made and you don’t have to bend them. Don’t even let anyone know that this CAN be done. Come up with a short phrase that you can repeat in your head when your blood starts to boil to help calm yourself down. It could be something like “this is just temporary,” or “I’m in control” to remind yourself that you’re ultimately in charge of your emotions. Think about the times that you’re more likely to yell. Do you yell when you’re tired or stressed? If I know that I have multiple deadlines or a lot of things on the calendar, I know not to invite people over or make any more commitments. I will be overwhelmed, and as a result, I won’t be a good parent. My kids come first, and if adding one more thing to the schedule—no matter how good it may be—will push me past my limit, it’s not worth it. Stepping away from a situation can sometimes be the most productive thing you can do—especially if it’s you who’s on edge and not your kids who are misbehaving. We all have days like this! Giving yourself a time-out will give you a chance to regroup and regain perspective—or go yell into a pillow until your frustration is purged and you’re ready to be kind again. “Kids, I’m losing my patience,” are some of the most effective words that I have uttered as a parent. This works well if your kids are a little older. It’s a warning—for both of us—that things aren’t going well and we need to make some changes. My older kids are usually quite responsive and attentive when I tell them this, but more important, it keeps me from sweeping my emotions under the rug or from thinking that I’m fine, when in fact, I’m about to lose my cool. And usually just saying the words out loud lets off enough steam that I’m able to regain control. Sometimes when my kids are doing something that makes me want to scream, I’ll realize that if I just took a moment to really observe them, I would have a better understanding of what happened. How many times have I sent the “innocent” child to a time-out or made harsh judgements before I really evaluated what was going on? Those are the times when I most regret yelling because it means that I assumed the worst of my child when they most definitely didn’t deserve it. Plus, there have been times when looking a little deeper made me realize there was something quite hilarious or heart-warming going on, and I would have missed it if I just jumped in with guns blazing. When my kids lash out at someone or something, I tell them that it’s okay to feel like hitting, but it’s not okay to hurt someone or break something and they they can instead hit a pillow or kick a ball to get that feeling out. I need to take my own advice. After I walk away, I try to do some a simple physical activity to redirect my frustrated energy into something like folding the wash, vacuuming the bedroom, or baking. I need an activity that I can do without having to think too much, to give my brain a chance to slow down and think things through, and I need an activity that is physical enough to help release that tension. What would your mundane activity of choice be? Remember this during those tough moments. They are children. Try to remember back to when you were a child. Our decisions as children are not always good ones and we need to use these moments as teachable moments. Okay, so even with all of these tactics, and even with all of our resolve, we’re never going to be able to keep a lid on it all the time. But when we do slip and yell, it’s important to be upfront with our kids and recommit to ourselves—and them—that we’re going to do better. Apologizing will let them know that you respect them and that you, even though you are imperfect, are trying to improve. And that’s important for them to know. You may need to repeat it a few times, but when you say “I love you” to your kids, it has a way of melting your heart and bring up a rush of mom emotions which can easily cancel out your anger and stop a screaming fit. Because we all love our kids. We really do. We just need to remind ourselves of this sometimes in the heat of the moment to stop yelling at our kids. What strategies do you use to stop yelling at your children?